These Low FODMAP stuffed eggs are an easy recipe to combine eggs and a smoked mackerel, a protein boost! Hard boil 4 eggs. Peel them, cut them in half and remove yolks. Place yolks in a bowl, mash with a fork, then add a mackerel, mayo, salt and pepper and mash again. Add 1 chopped spring onion, green part only and mix. 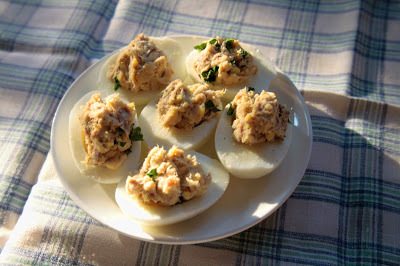 Fill eggs with the smoked mackerel pate just made. Decorate Low FODMAP stuffed eggs with the other chopped spring onion.